At LeRoy UMC, we believe that we are an integral part of the community in which we live, both locally and globally. We partner with a number of ministries to maximize our ability to reach or community. Community Choir – “Sing to the Lord a new song, sing to the Lord all the Earth.” Psalm 96:1 A love of music brings together this community choir on Thursdays from September to November with several community performances. As the home to the choir, we invite anyone who loves to make a joyful noise to join us. Community Good Friday Service – As Easter approaches each spring, we take time with a number of area churches to remember and celebrate Good Friday. Each year, rotating churches, the community comes together for this special worship service. 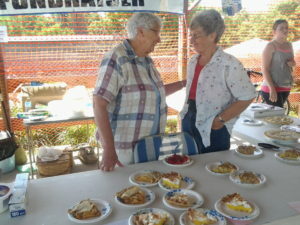 LeRoy Razzasque Days – On the second weekend in July, we partner with the Cadillac Evening News for the Chicken BBQ on Saturday of the festival. Our church provides the desserts – a homemade piece of pie and a smile. Community Ash Wednesday Service – Our community gathers together to remember Ash Wednesday each year with other churches in the area. It is a special service open to everyone in the area to participate. Northwest Food Pantry – Housed at the Tustin Augustana Lutheran Church, our local food pantry relies heavily on the donations of churches and individuals to stock it’s shelves and reach families in need. Samaritan’s Purse Shoebox Ministry – Operation Christmas Child reaches millions of children worldwide with the gift of love and most importantly the story of Jesus Christ. 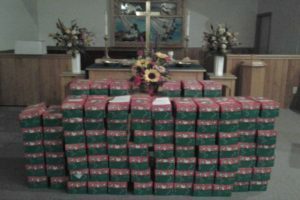 We are so proud to partner with them and other community groups to create and pack shoe boxes each November.